The focus of this antiphon is Hildegard’s praise for her comrade in virginity, expressed in three particular symbolic images that articulate the special contemplative gift afforded “the new posterity” of the Order of Virgins within the Church. The first of these—the speculum columbe—expresses the idea that, in imitating the purity of the simple white Dove, the virgin contemplative receives from the Holy Spirit the gift of gazing upon divine mysteries at their font and source, unimpeded by the cloudiness and shadows that plague the person still wedded to the desires of the flesh. 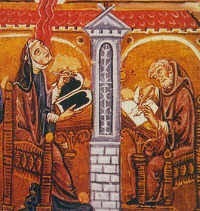 The absolute purity of the divine foreknowledge as the source of all being is only perfectly available through the chastest flesh of that divinity’s Incarnation, whose imitation the virgin contemplative seeks—Hildegard expresses similar ideas in her antiphon for the Virgin Mary, O splendidissima gemma. The music in this first part of the antiphon for St. John works to emphasize that the more chaste one is, the more pure the contemplation will be, by repeating the same motif on castissime and purissimo—a motif that itself reaches to the high C, the highest note in the piece. For St. John, who lived with Jesus in the flesh, this gift of clearest contemplation came when he lay nearest to the Lord at the Last Supper. As he rested his head upon Christ’s breast, John drank from his heart—the fons sapientiae, the source of wisdom (Sirach/Ecclesiasticus 1:5)—in fulfillment of Christ’s words, “If any one thirst, let him come to me and drink. He who believes in me, as the scripture has said, ‘Out of his heart shall flow rivers of living water’,” (John 7:37-38). This “living water” flows also to water the second symbolic image for John’s virginity, the flower. This was a common image in Hildegard’s pieces devoted to the Virgin Mary and her Son (see e.g. Hodie aperuit nobis or Ave generosa), but she gives it a unique treatment here by invoking, not just a flower, but very concept or idea of flowering (floriditas)—a state of perpetual, virginal flourishing that takes its root from its eternal planting by the arresting image of God the Gardener. This planting, however, is also the mission of a new and holy race. “And they sang, as it were, a new song before the throne, and before the four living creatures and the ancients,” (Revelation 14:3). What does this mean? In those faithful ones who embrace chastity for a good purpose and preserve their virginity unstained for love of God, good will bursts forth wonderfully in praise of their Creator. How? In the dawn-light of virginity, which always surrounds the Son of God, steadfast praise is hidden; no worldly office and no tie of the law can resist it, and it sings in the voice of exultation (Ps. 41:5) a celestial song to the glory of God. How? This antiphon displays a somewhat unusual modal configuration. While it is in E mode, E is never used as a grammatical marker, as is common in Hildegard’s work. Rather, it begins with the pitch E and moves immediately to C as the primary outlining tone. G is used as a secondary outlining pitch, and the melody does not return to E until the final note. The salutation, O speculum columbe, is rather long, and for ease of reading, is divided into two lines, with a tick barline at the end of line 2 of the transcription. Lines 5 and 6 are similarly structured. Phrases are otherwise self-contained on a single line, with two additional exceptions: lines 8 and 9 on page 1, and lines 10 (page 1) and 1 (page 2). O mira floriditas can be grouped with que numquam aresens cecidisti, and quia altissimus can be sung as one phrase with plantator misit te. The lines have been separated in the transcription, however, based on similarities in melodic units. O mira floriditas and quia altissumus contain almost identical melodies, and the melodic lines on que numquam... and plantatator... are also somewhat parallel structures. Singers should feel free to choose how much, if any, separation they wish to employ. In this piece, Hildegard uses C a third below the final as the primary phrase marker. C an octave above appears on select key words, a strategy familiar in Hildegard’s works. The use of the high C and its characteristic motive serves to link certain ideas. It first appears on castissime (“most chaste”) and a few lines later on purissimo (“most pure”), linking the two key themes of human chastity and divine purity in Hildegard’s theology. Thus it is also sounded on filius (“son”) and agni (“Lamb”), directly connecting John’s pure chastity with that of Jesus. Finally, the C motive echoes multiple times to reinforce this link on electa amicicia (John’s “chosen friendship” with Jesus) and nove sobolis (the “new race” of virginity forged in that friendship). Hildegard of Bingen, Symphonia, ed. Barbara Newman (Cornell Univ. Press, 1988 / 1998), pp. 166 and 287.